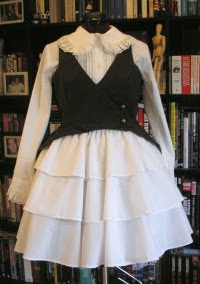 This week I've finished the waistcoat that goes with my three tier skirt. 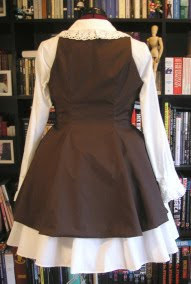 I changed the design a bit so it's a bit more like a tailcoat - except it's still a skirt at the back. I've also got a blouse that matches! No I didn't make that one, its actually from Baby. I think I still need to make a tie or something to go with it, maybe a very thin bow? Anyway, I'm pleased with the way it looks, though it's not especially flattering on. I might make another one at some point and make the front extend down further. I'd like to make it from better fabric, maybe something a bit thicker and also put some lacing at the back as the mid section seems to be really calling out for it on this picture. This turned out great! How is it not flattering? Tailcoat = win. @Lenore - Thanks! Glad you like it. Do you sew yourself? @Naka - ha ha, I love it too. I got it in a lucky pack swap. gorgeous blog! wow, this is amazing! I love the way you finished it! Its lovely indeed! I liked the front better without the straight parts, the back is amazing!